The fortified tunnel (at left) leading from the palazzo to the castle keep of the della Corgna family of Castiglione del Lago. 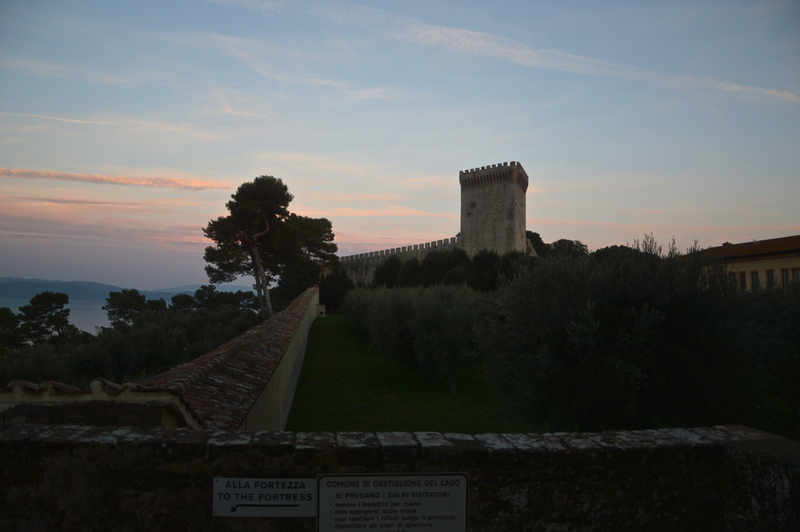 Over the last month we have visited two fortresses: the 13th-16th- c. castle of the famiglia della Corgna at Castiglione del Lago, on the west side of Lake Trasimeno, and the largely 14th-15th-c. Rocca Maggiore that perches above Assisi. In both cases, the boys enjoyed climbing up the towers and skittering through some of the very long tunnels that connect parts of the respective complexes. Both fortifications are also connected to Frederick II, Holy Roman Emperor (himself born just east, near Ancona), who was baptized at Assisi and spent his early years in that castle, and who ordered the construction of the castle at Castiglione del Lago just a few years before his death.